Sweet mountain cabin in the woods between Bozeman and Livingston. Built to reflect specific periods and methods of building history - an amazing finished product! Great location halfway between the western town of Livingston and Bozeman - both great towns with lots of restaurants, galleries and shopping. Four wheel drive vehicles are recommended especially in the Spring and Fall. The home has one bedroom plus a pullout sofa in the lower level sitting area and two full baths. 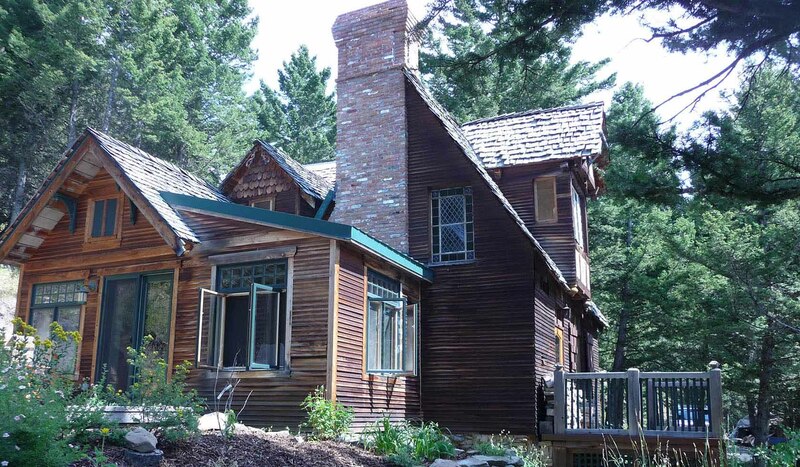 Brief Description: This sweet cabin is located up in the mountains between Bozeman and Livingston in a very private wooded setting. The home is about three miles on a dirt road from the Interstate. The cabin is about 15 minutes from Livingston and about 20 minutes from Bozeman. The cabin is the result of a building project over the years, that modeled various periods of American building history. Stained glass windows, hand made open trusses, and an open indoor cooking fireplace (which is not for actual use) are some of the unique features of the cabin. Bedrooms and baths: The bedroom is located upstairs in the home. The queen size bed is tucked into a cozy alcove. A deep jetted tub in the corner welcomes you after a day of hiking and exploring, and a private washcloset is on the second level as well. Around the corner from the bedroom is a small living area, set up with television with Satellite TV and a DVD player for some evening movie watching. Kitchen, living and dining area: The kitchen has a huge old fashioned wood cookstove, as well as all the modern appliances. There is also a cooking fireplace in the adjoining sitting room, complete with cast iron pots and a brick oven built into the fireplace. This fireplace is purely decorative and has candles in it that can be lit, but no fires. A pullout sofa in the sitting room can accommodate an extra guest or two. A dining room is set up in the sunny room off the kitchen... or head out to the fabulous patio for some outdoor meals. The patio area features adirondack chairs, picnic table, sun umbrella, and an outdoor fireplace! The outdoor wood fireplace is great for an evening gathering, and also serves as the barbecue grill for outdoor meals. There is a small stereo upstairs as well as in the kitchen that plays CDs. There is a television with satellite, DVD and a large collection of movies for some evening entertainment. Setting, acreage, views: Heartwood is on ten very private acres in the Gallatin Mountain range between Bozeman and Livingston. Easy access to town, yet incredible privacy and wildlife viewing right from your own back door! Activities nearby: Outdoor recreation in the immediate area includes hiking, fishing, rafting, mountain biking, horseback riding and relaxing. Yellowstone Park is just 1.5 hours from the cabin, and for an especially memorable experience in the park, book a specialized private tour with our sister company, Greater Yellowstone Guides. There is so much to do! Distance to airport: The Bozeman airport is just 40 minutes away.